If you thought you knew fried chicken, think again. 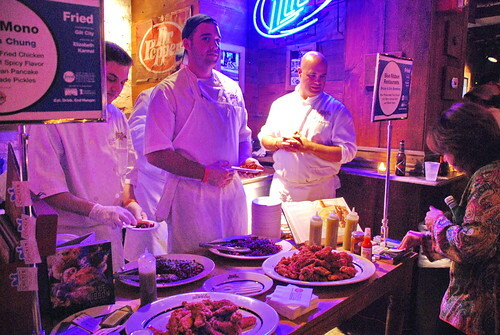 At the NYCW&FF Fried event on Saturday night at Hill Country BBQ, guests got to sample renditions of fried chicken and fix’ns from 16+ different restaurants and chefs, including Seersucker, Blue Ribbon, Red Rooster, Pies 'n Thighs, D.C.'s Art and Soul, and many others. Variations ranged from classic styles to creative reinterpretations and ethnic twists. There was something for everyone and the smells were enough to get anyone’s mouth watering. 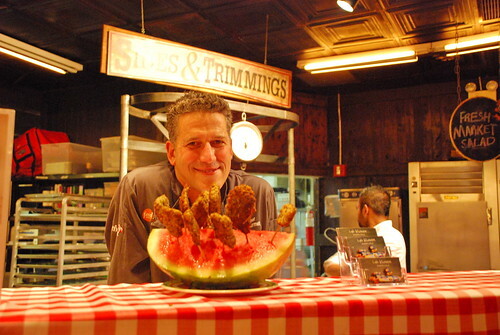 This is FRIED CHICKEN we’re talking about people! I know I’m not alone in my love of fried chicken. This event was packed and among those digging in was a quite an impressive list of foodie celebs. 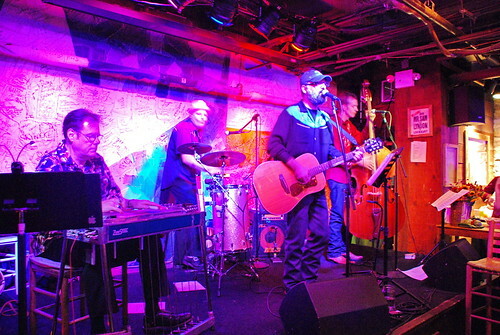 Bobby Dean guest hosted the event and shared slightly lighter versions of Momma Paula’s Cheesy Mac and Sweet Potato Bake. 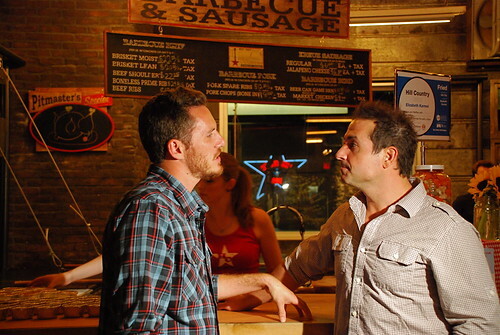 Here he is being interviewed by Top Chef Season 4's Spike. More Top Chef alums were in the house. 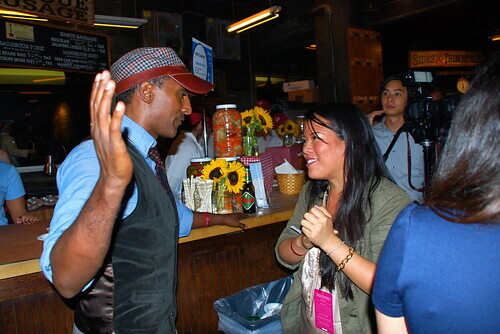 Here's Lee Anne Wong from Season 1 chatting with Masters winner Marcus Samuelsson. 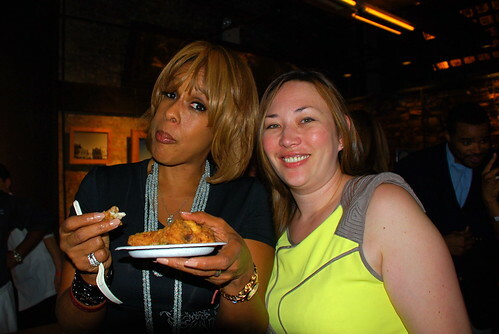 Even Gayle King stopped in to get a bite! Here she is with Jennifer from Mina Productions. 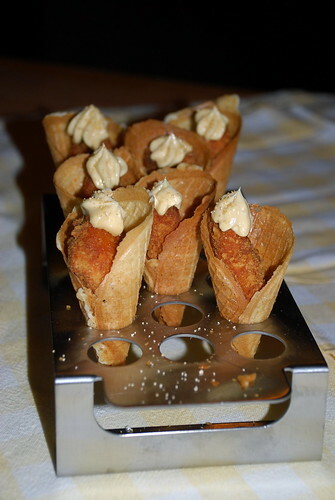 Hill Country's Chicken and Waffle cone with a dollop of maple butter was whimsical and delicious. 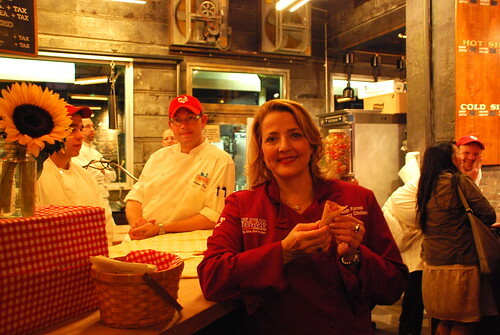 Here is Chef Elizabeth Karmel with her creation. 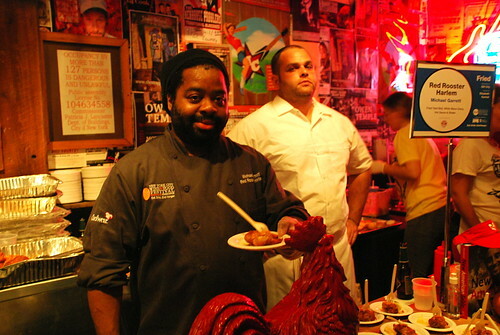 Chef Michael Garrett of Marcus Samuelsson's Red Rooster Harlem obliged me in posing with their Fried Yard Bird with White Mace Gravy. I LOVED this smoky and spicy sauce. I hope to try it at the restaurant sometime, but reservations are still hard to come by. The team from Blue Ribbon served up fried chicken paired with an unexpectedly delicious wasabi honey sauce that I was dreaming about the next day. If I got my hands on a bottle, I think I would drink it straight out of the bottle. 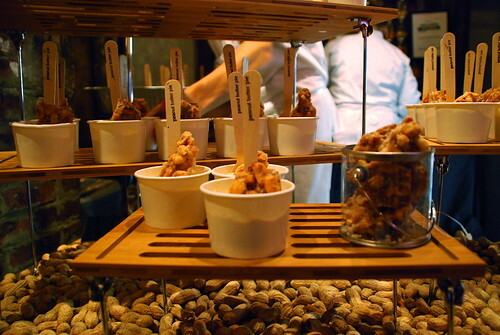 Chef Bob Blumer, The Surreal Gourmet, handed out his Chicken Popsicles, little nuggets that popped with flavor. Dessert came all the way from my home city of Miami and Michael's Genuine Food & Drinks Chocolate Peanut Pie with Pretzels, Bacon and Smoked Peanut Brittle. There was sooo much going on in that cup and they were all good things. It was all finger lick’n good! 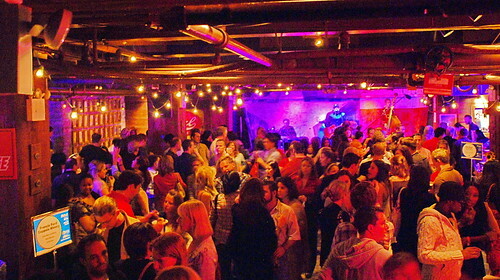 The food was fantastic, the music was great, and the party was a pretty toe tapping good time. For lots more pictures of the food, the chefs, and the event, check out the flickr set. Thank you again to Mina Productions, who organized the event, for giving me the chance to take these pictures, and to Tara, the Fun, Fearless, Foodie, for hooking me up with the connection. Man, so wish I could have been there! Looks like a fun time!